Production on the Miskatonic Alumni keychains is underway. Here's the manufacturer's mockup of the design after tweaking the lettering to make sure it would register correctly. I went with a 1.5" fob in cast and polished brass with a fired black enamel infill. It might not stop a bullet, but it's tough enough to avoid getting scratched up by keys or pocket change. I should have the patches and lapel pins finalized by the end of the week, if not tomorrow. That will take care of all the hard goods in the package. Unfortunately, production costs are running a little higher than I expected. That's not a serious issue, at least not yet. I've set aside $600 to cover the postage on the run (assuming 100 Small Priority Box packages) and can dip into that cash to cover any overruns. I have not yet begun to speak kind words! I've got a project in the works right now, I'm hoping that a standard first-class letter stamp will do the trick. Still, that'll add up over a large amount of them. Plus envelopes. And addressing them... And got myself a PO box for returns. "Looks 'good'"? How about "looks GREAT"! Will these be available separately for thode of us who already have the rest? Postage adds up fast. One of the reasons I'm sticking to a certain size and number of items is to take advantage of the Priority Mail fixed prices. It's the best bang for the buck you can get. I'm ordering 125, so there should be some extras left if the full package sells out. I always over order a bit to cover packages getting lost in the mail. How can we purchase these later? I'll have more details once the final packages are assembled. I also wanted to mention that I have a vector 'period' First National logo handy. It's a chain store mentioned in The Shadow Over Innsmouth. In case you had any ideas about how to use that; aside from matchbooks...? Looks neat! Deeply excited about this. 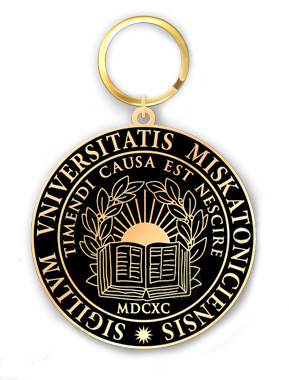 I'm definitely going to own more official-looking Miskatonic accoutrements than either university I've actually attended. So great to see this adventure advancing that fast! Can't wait to wear my key-chain and patch here in Paris! I'm already wearing my Australian Expedition on a duck Pointer Brand and they're aging very well together. Having purchased quite a number of your Miskatonic props in the past I'm ashamed to say this nearly slipped my notice. Just wondering if you are still prepared to ship to the UK & if so what is this likely to cost?